Apple's World Wide Developer Conference (WWDC) kicked off today with the unveiling of iOS 6 for the iPhone and iPad. Apple is promising over 200 new features in the latest version of its mobile operating system, but only a few of them were highlighted in the keynote. June is an exciting month for smartphone fanatics as Microsoft is expected to unveil the next generation of Windows Phone at an event next Wednesday, June 20 while Google is expected to reveal its plans for the next version of Android, codenamed "Jellybean." While some of the features Apple announced today already exist on competing platforms, Apple is putting its own twist on these updates. For example, Siri, Apple's voice-activated virtual assistant, is even smarter now with support for sports, movies, and restaurants. Siri can also directly launch apps, but you still can't control these third-party apps with your voice. Apple is also breaking up with Google Maps and launching its own Maps application with iOS 6. It includes local business information, Yelp integration, real-time traffic updates, and turn-by-turn navigation. Naturally, Apple has also added Siri integration to maps so you can ask questions along your journey such as, "Are we there yet?" or "Where's the next gas station?" Apple has also added a 3D/fly-over mode to its Maps application, which shows you detailed 3D models of buildings and landmarks. These updates certainly give Microsoft and Android something to chew on. While both competing platforms offer voice-command support, those features are crude in comparison to Siri's artificial intelligence and natural dictation. Microsoft's Bing Maps could definitely use a revamp in the next version of Windows Phone as its turn-by-turn directions feature is quite clunky (you must tap your phone at each turn). 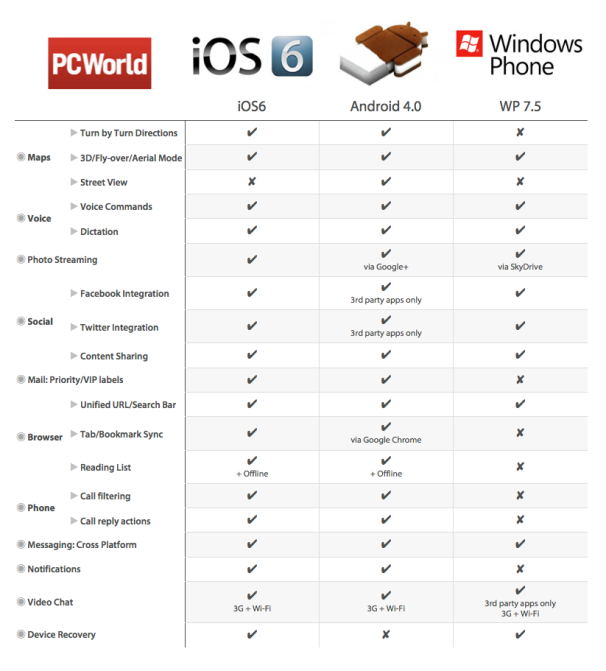 We'll be revisiting this comparison later this month as Microsoft and Google roll out new versions of their respective mobile platforms.